The trouble with a strong start is always going to be how do you follow that up? It’s an age-old problem that bands and films have struggled with for years. 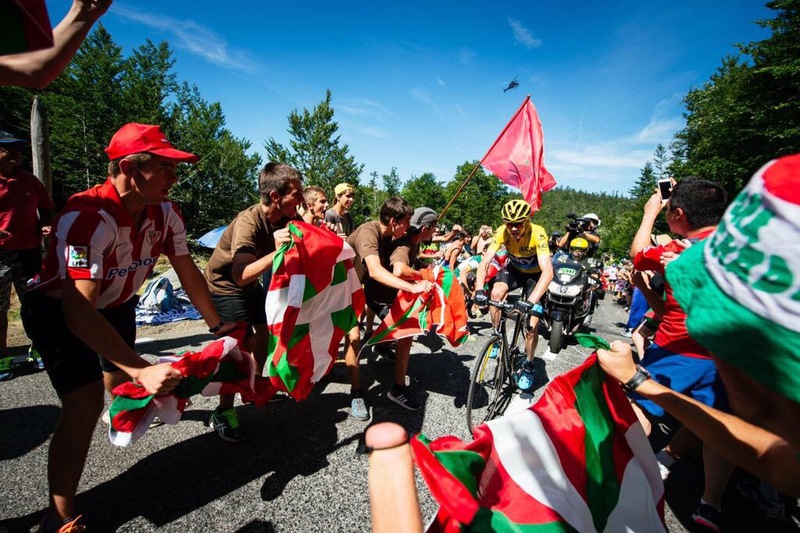 The barnstorming opening phase of the 2015 Tour de France set the bar very high.. The question this week inevitably would be, was it too high?? Week 1 surpassed all expectations in terms of action, incident, accident and intrigue, and we could all be forgiven for thinking that the rest day and the arrival in the Pyrenees could have been the prompt for a slowing of the pace in order for the peloton as a whole to regroup and reassess the days ahead. With the unknown climb of La Pierre-Saint-Martin suddenly rearing it’s hors category head at the end of Tuesday’s Stage 10, should have been one of those days where watching each other was the watchword. Particularly if you are Chris Froome and have just spent the last 9 days riding yourself into a position of strength that you can look to solidly defend. Not satisfied with coming through the first week in a far better position than almost anyone had given him a chance of, and in doing so putting significant time into all the other pre-race favourites, Chris Froome and Team Sky might have been forgiven for playing a more defensive hand as the road reared up on the first Pyrenean stage of the Tour. Instead they came roaring out of the rest day traps and simply laid waste to the field in a merciless show of strength and preparedness that showed that they clearly believed in attack being best form of defence. Seven km from the top of the climb Froome absolutely detonated the race with a trademark high-cadence attack, leaving all in his wake. The yellow jersey simply ride them all off his wheel and Nibali, Contador and co suffered even greater reverses than in week one. Even Quintana ceded over a minute to Froome and then suffered the further indignation of being re-caught by Froome’s last pacemaker, Richie Porte, who nipped past him to steal some of the bonus seconds and a chunk of KOM points. No prisoners was obviously the order of the day. It spoke volumes about two things: Froome’s sparkling form and his indifference to stoking the fires of rumour and insinuation that had raged through the rest day like wild fire. Leaked or hacked power data – from Froome’s equally dominant showing on Mount Ventoux in 2013 – had restarted the old accusations that “surely this is impossible unless you are cheating” and Sky had spent much of the day fighting and apparently ill-thought out battle of PR reverses. Many teams in such an already dominant position may have elected to follow the wheels for awhile. Not Sky though. not Froome. As we saw in 2013 – and also contriverrsially in 2012 with Brad on La Planche de Belle Filles – holding back is not in this boy’s nature. It was a whirlwind that the British team and rider would have to reap as the week progressed. 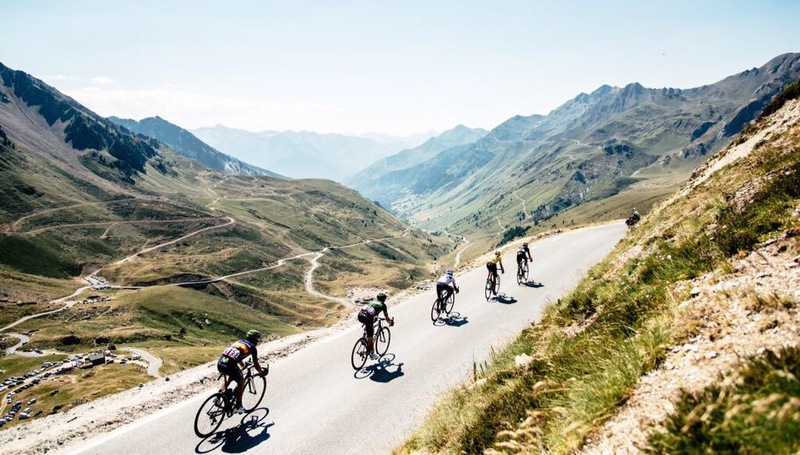 With the GC teams reassessing once more after the Froome-Bomb of the day before, the second Pyrenean stage did see the GC leaders put their battle on ice. This allowed teams to stretch their legs in other directions and it was Rafa Majka who make the decisive move from the break after the group had passed over the Col de Tourmalet. His Tinkoff-Saxobank teammate Ivan Basso had left the Tour two days earlier after soreness following a week one crash had prompted some extra tests which returned a diagnosis of early stage testicular cancer. Majka’s victory, mirroring the two he took in the race last year but thankfully without the pantomime winking this time, went some way to restore a sense of hope in a team that was suffering from the departure of Basso, the misfiring of Contador and the increasingly exasperating exertions of Peter Sagan to transform just one of his many second places into a first. 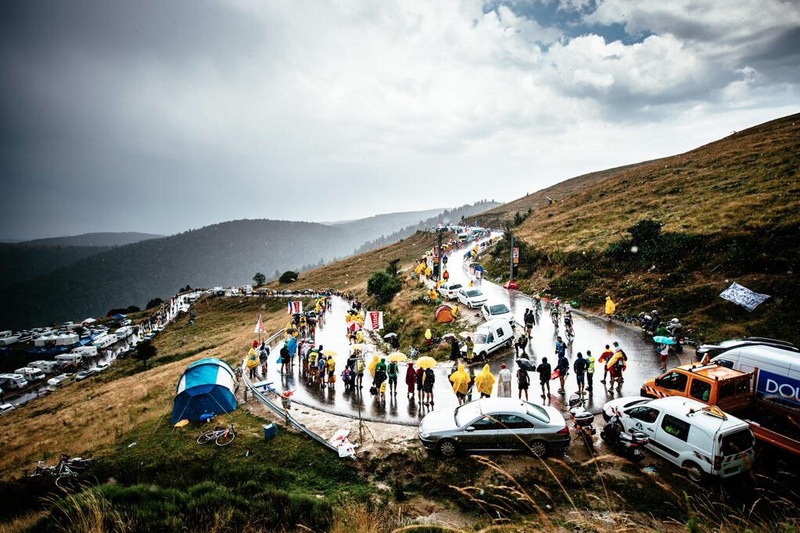 The weather broke on stage 12 and the rains hit the finish area at Plateau de Beille hard with hail stones scattering journalists and fans earlier in the day. By the time the riders arrived at the base of the climb it had improved sufficiently to allow a little sunshine through so it was fitting that the rainbow jersey of Michael Kwiatkowski should be the lone leader. 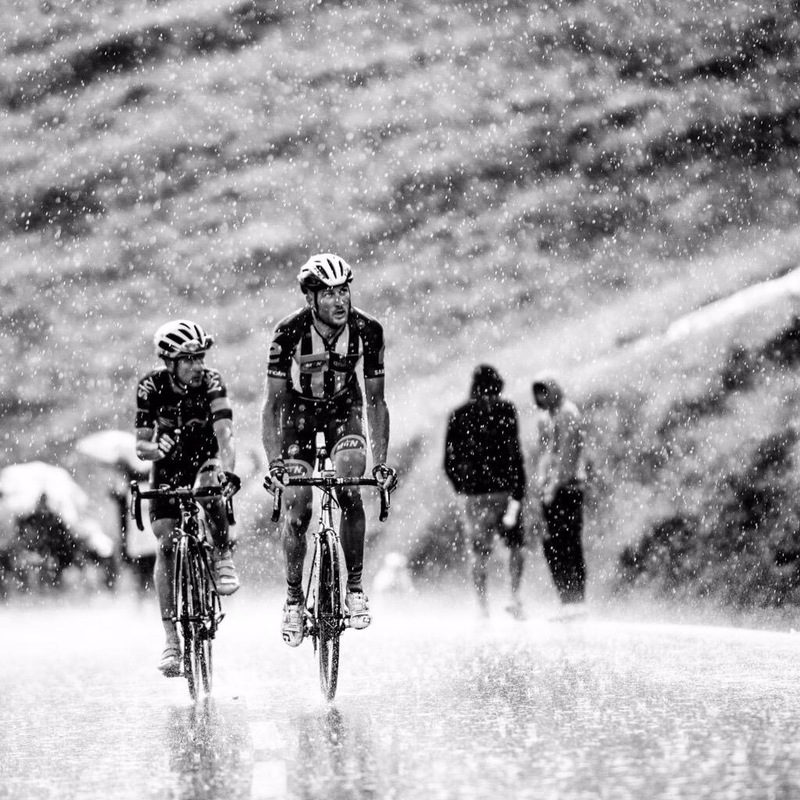 Rainbows though are fleeting and Rainbow Jersey’s wins are often equally elusive. Kwiatkowski faded and Joaquín Rodriguez swept up the climb for his second win of the race as the GC group quickly plundered back the time gap that the breakaway had fought all day to create. The meteorological storm had passed the next morning but the clouds hanging over Team Sky were still gathering. 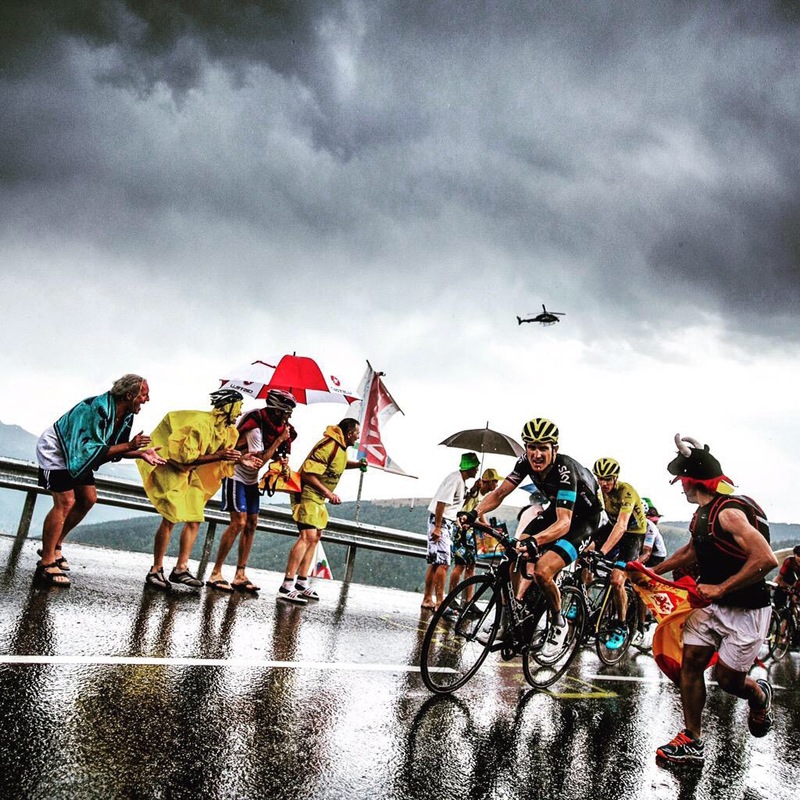 As the peloton embarked on a series of ‘transitional’ stages that would see them leave the Pyrenees and head across Southern France towards the Alps, the storm was about to break. Over the coming days Porte would be punched by a spectator, Froome would be doused in urine and Brailsford would be desperately looking for a way to be transparent in a world that would much rather see shadows and nefariousness. Stage 13 may have been billed as a transitional stage but the denouement was anything but the kind of flat run-in beloved of sprinters that normally . The punchy uphill finish at Rodez looked prime for an all-rounder and with a hundred metres to go Sagan was in that prime position, almost freewheeling behind Greg Van Avermaet. I thought that he was expertly toying with him, waiting for the best moment to make the inevitable jump. As so did Sagan it seems. But, inexplicably, it never came and the Slovak rider finished second by over a length, having simply failed to pull the trigger. He blamed it on his ‘stupid head’ in an interview full of brutal honesty but without the petulance that sometimes plagues him. It obviously couldn’t believe it himself either.. Despite the acres of Sagan-esque evidence to the contrary, sometimes however fairytales do come true and Stage 14 proved to be one of those such days. July 18th was Mandela Day and the Aftican-based MTN-Qubeka team set out to make another big splash on the race. They succeeded in their first mission by placing a rider in the break but we’re probably a bit unnerved to see that nearly all the other teams had down so too. Around 27 riders ploughed ahead of a torpid peloton including multiple riders from FDJ and AG2R who were looking to deliver their fallen GC hopes a stage win instead. The final climb to Mende looked to have had the sorting out of the break with MTN’s big Brit Steve Cummings dangling off the back at the base of the climb whilst the more familiar names – even to UK audiences perhaps – of Thibaut Pinot and Romain Bardet fought the incline ahead. But by the time the road flattened in readiness for the last 2km run to the line, as the two Frenchmen squabbled for the better sprint position, Cummings appeared, Roche-like, and simply flew past them. The former Sky and BMC man put his head down and took a win that challenged Tony Martin’s Week One win for its all-round feelgood factor. Unlike Sagan the day before through, there was no surprise here from the team or the rider. They had a specific plan – “Get Steve in the break and he will do the rest” – and, having rested as much as possible during the first ten stages, he executed it to perfection. It was more expected transitional stage fare the following day that saw André Greipel take his third win of the race. Less expected were the absence of Mark Cavendish and inclusion of Michael Matthews from the final gallop. The Manxman was suffering from intestinal problems and had gone into damage limitation mode early in the day, just trying to make it through to Paris and his beloved Champs Élysées, whilst the Australian was finally starting to recover properly from the injuries sustained in the Stage 3 crash that accounted for his teammates Gerrans and Impey’s withdrawal. It’s fair to say that Matthews has spent two whole weeks in damage limitation mode nursing broken ribs and other injuries across this tough parcours. His top ten placing showed a recovery of body but a continuation of the indomitable spirit that has got him this far. It also finally relieved him of the Lanterne Rouge position at the bottom of the standings.. Stage 16 downhill finish to Gap featured the descent off the Col de Manse, made infamous by Joseba Beloki’s career-ending crash in 2003. The Spaniard’s femur-breaking crash on melting tarmac prompted the across-a-ploughed-field deviation by Lance Armstrong at the height of his powers. The road again offered incident in both the stage and the GC battles with Lampre-Merida escapee Rubén Plaza locking up on a corner that would later pose a similar test to Warren Barguil and those following him. Whilst Plaza was able to correct himself without incident and go on to hold off Sagan, who recorded his 16th TdF second place, Barguil’s wobble had greater consequences. Just as Armstrong had to avoid Beloki 22 years ago, Geraint Thomas had to do the same this time to miss Barguil. But instead of cruising across an open field the Welshman encountered a lamppost head on and hearts were in mouths for a few moments until word came though that he was up and racing again, uninjured. Both Contador and Nibali tested race leader Chris Froome, on the ascent and descent respectively but the maillot jaune survived the attacks and heads into the second rest day with an even healthier lead than the one he enjoyed on the first. With only the Alps to come, time is beginning to look short for this pursuers. GC – Chris Froome (TEAM SKY) 59:58:54; Nairo Quintana (MOVISTAR) +3:10;Tejay Van Garderen (BMC RACING TEAM) +3:32; Alejandro Valverde (MOVISTAR) +4:02; Alberto Contador (TINKOFF-SAXO) +4:23. Points – Peter Sagan (TINKOFF-SAXO) – 360; André Greipel (LOTTO-SOUDAL) – 316.